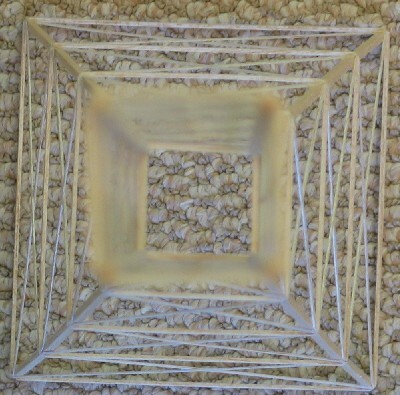 This tower was 24 inches tall, 6 inches wide at the base, tapering to a 1 & 1/2 inch square at the middle. This tower weighed 7.0 grams, and held 11kg for 2nd place at the 2005 GA Science Olympiad State Finals. recently about the best way to go about this. I responded that I wasn’t quite sure. I have heard of people making jigs, but I can’t think of how to make a jig for this. On my desk (which isn’t level), I have a sheet of graph paper. On it I have 5 dots. 4 of the dots mark the outside points of the base of my tower. The 5th dot is the dead center of those other dots. Because my desk isn’t level, I put a strip of wood under two legs of my tower to make it level. Only one dimension of my desk wasn’t level, so I fixed that by adding a piece of wood under two legs. And yes, I did use a small level to make sure that it was now perfect. Now I know that the bottom the base of my tower is level. Now I need to make sure that the top of the base is level. So I placed my loading block (one I bought from Pitsco) on top of the base to see if it was already level. It wasn’t. So I began sanding. A little bit here, and a little bit there. I didn’t just so this randomly, but using the level I tried to see what leg was making the tower un-level and sand that one. I ended up sanding a little too much, so I had to sand another leg. Finally, I have the base of my tower perfectly level. Now the trick is the actual connection of the top part, and making sure the top is level. One of these days I will take pictures of this setup to connect the two parts to a Science Olympiad tower. If you know of a better way, please enlighten the rest of us. Are 1/4 inch legs good? 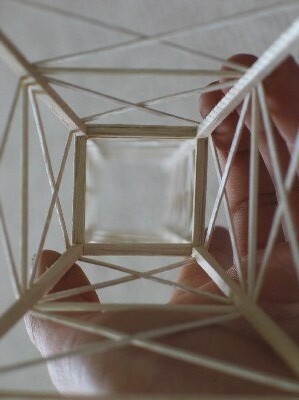 Dear Garrett, I am following a design very much like yours for my tower. 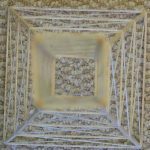 I am currently building the lower half and I have put together the top square piece (2″x2″) and the larger bottom square piece (6″x6″). 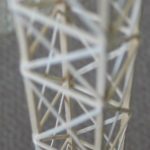 I will have to do this by connecting both pieces with 4 legs so that the lower half of the tower is 8″ long. I am having a very tough time doing this. Do you have any helpful tips? How did you assemble the lower half of your tower? The assembly is definitely hard. I am pretty sure that I made two sides of the tower on a flat surface, and then somehow clamped them together with temporary bracing while I glued on the actual bracing. I didn’t have a jig. How tall were your bottom part and top parts? How did you build your top and bottom ie. your top built like a plank bridge or something? and your bottom I don’t even know how you were able to build it like that. Would you think that dropping everything but the main legs (thick non-bracing) to low density would bring efficiency up? And finally, is there a jig maker out there anywhere? I’ve been trying to find one as that makes everything more replicable and faster. this is my first year doing towers, is 1cm by 1cm legs overkill? were the legs made out of bass? Wow, it must be a long time ago that I built this tower, because I cannot remember the answer to this question either. 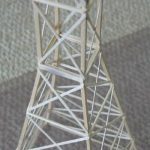 I know that I used bass for the legs in some towers, but I was also experimenting with balsa legs during this time. I don’t know for sure. How/Where did your tower break? James, I honestly do not remember. 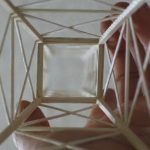 This is a really nice design; I noticed that the base/main part (I’m not sure what to call it) is thicker than the members/trusses/bracing. What different sizes wood did you use? Thanks! Sam, I think the 4 main legs were 3/32″ square sticks. The X bracing I cut by hand, and it was 1/32″ x 1/16″. 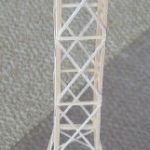 The horizontal bracing was 1/16″ x 1/16″ low density Balsa. Did you bend the wood or is it two separate parts (bottom and top)? The tower is in two separate parts. Is it better to build in two parts or just curve? did you use balsa or bass wood for this tower? i am a first timer with towers so any help would be great! 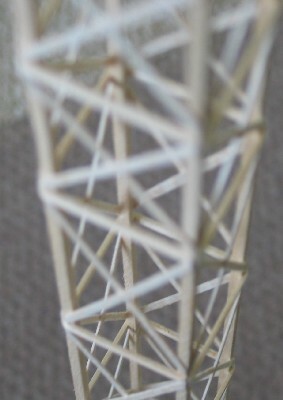 Lily, I only used Balsa wood for this particular tower. GB i would not mind writing it if you just sent me some tips i could neaten it up in my writing classes at school as extra credit and i could find some info for you it would be fun. FT, thanks for the suggestion. I will definitely look into writing a tower ebook. It probably won’t be any time soon, however. I am staying pretty busy in school right now. It might be a Christmas break project. 45 queries in 0.537 seconds.